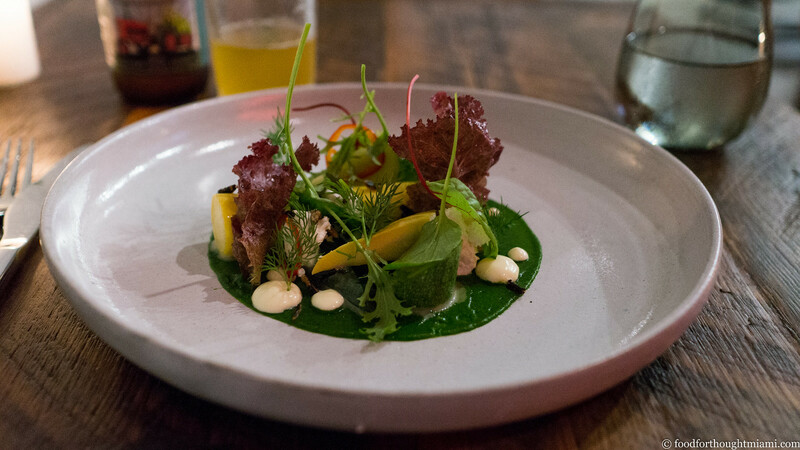 Vegetables are generally a strong suit at Alter, and their preparation gets every bit as much attention as the menu's animal population. Plump Florida oyster mushrooms are cured in salt and soy, then smoked and roasted for an intense umami payload. 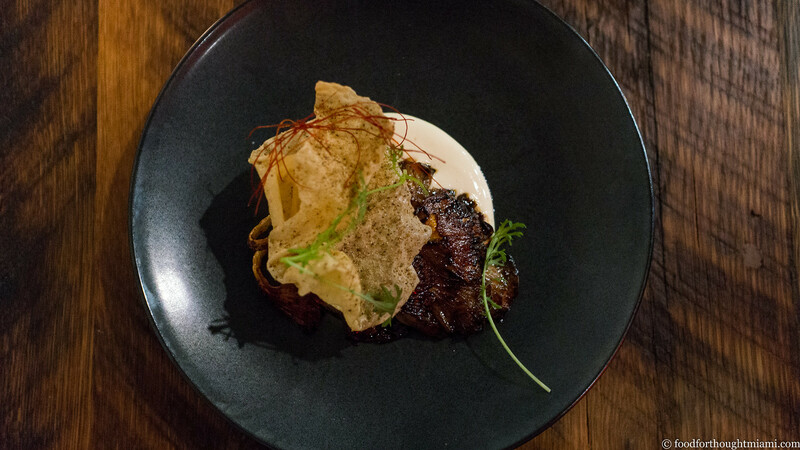 A fist of the mushrooms is plated over an equally intense Beemster Gouda cheese purée, then topped with an airy, crisp sheet of yuba (tofu skin) and some Korean chile threads. It's a great dish. 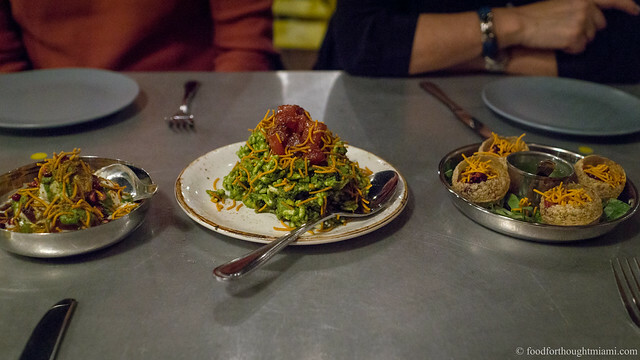 A leek "chorizo" entrée is full-blown vegan, a tranche of the allium braised until soft and sweet, lightly charred and napped with paprika oil, and sprinkled with toasted garlic, mimicking the flavors of the namesake sausage. It's served over a puddle of creamy almond milk, along with some dense, hearty turnips and wispy greens. If every vegan dish tasted this good, I could be convinced to convert to a plant-based diet. But then I'd miss another of the best things I've eaten at Alter. I'll just copy what I said when I named this the "best thing i ate last week" after my first visit to the restaurant: Cheeks are like the pork belly of fish: richer, fattier, moreish. This grouper cheek is meaty but giving, substantial enough to stand up to the intense shoyu hollandaise draped over it like a velvet robe. Various seaweeds and flowering dill are scattered about, like it just washed up on a black sand shore (that's actually creamy black rice). A couple twists of cucumber and thin rounds of chile pepper provide a bit of palate-cleansing snap. 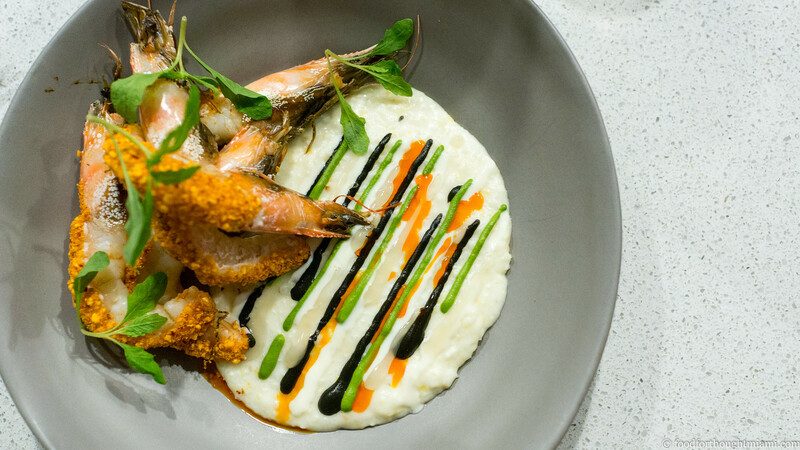 I found another favorite on my most recent visit (again quoting my own "best thing i ate last week" from this past week): the tajin-crusted Cape Canaveral prawns, strewn over a bed of creamy corn grits lashed with stripes of mole verde, lime crema, and huitlacoche. It's a beautiful combination – like a next-generation Mexican shrimp 'n' grits – but what really elevates it is the quality of those prawns, tender and juicy underneath their chile and citrus coating, their heads bursting with oceanic goodness when chewed or squeezed. What's also notable – and a sign of more good things to come – is that Brad is a tinkerer. He is always tweaking and looking for ways to improve. 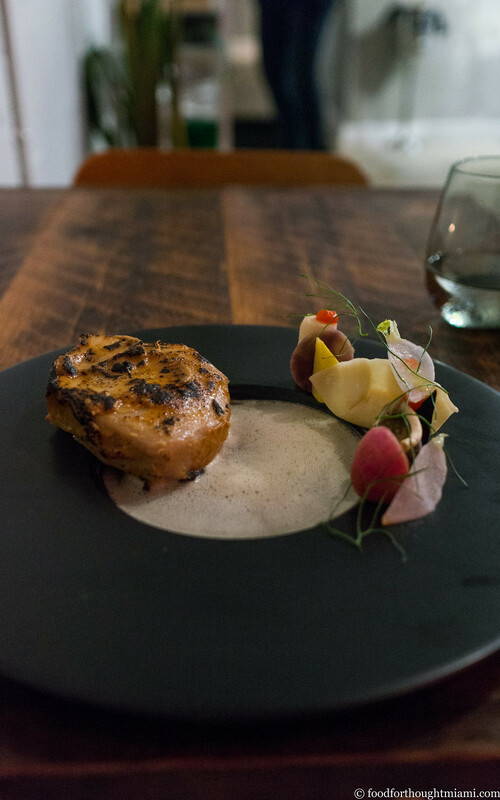 One of the few dishes that I found underwhelming on my first visit – a swordfish with charred avocado butter, nicely cooked but somewhat bland – had undergone a metamorphosis by my next visit. 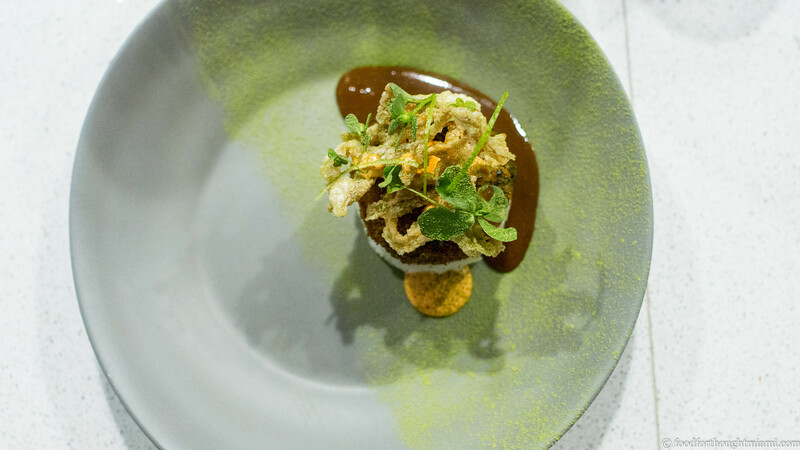 The steak-y fish still had the luxurious texture of a seafaring filet mignon, but now it had been rubbed with miso and soy to bump up the umami, and the avocado butter had been swapped out for a more deeply flavored bacon avocado dashi. 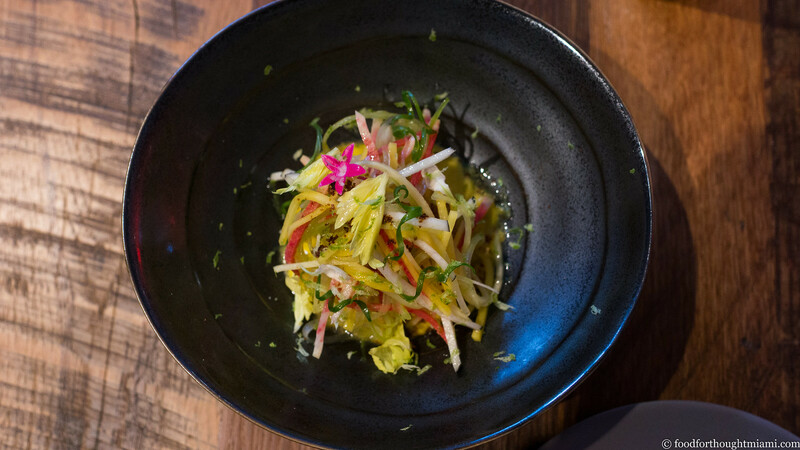 A plump shrimp gyoza, some slivered raw vegetables, and dots of a pickled chile sauce now complete the dish. Brad confessed to me that the first iteration of the swordfish was his effort to provide a "safe" dish – a refuge for the conservative diner who just wants their "piece of fish." But after their first month of operating, he found that customers were responding favorably and that he really didn't need to offer that kind of sanctuary. I'm glad, as the dish is now on par with the high level of everything else I've had on the menu so far. And every couple weeks or so it seems that a new item slides onto the menu, like the "pork tonkatsu" I had on my most recent visit, combining a crispy breaded disk of pulled pork cheek served on a bed of lemon-infused sushi rice, topped with crispy pig ears and purslane fresh from the restaurant's garden, dusted with matcha powder and drizzled with a house-made tonkatsu sauce. There's no dedicated pastry chef at Alter, though Brad (who has worked the pastry station before) can get some tips at home from his wife Soroya, who is a pastry chef herself. 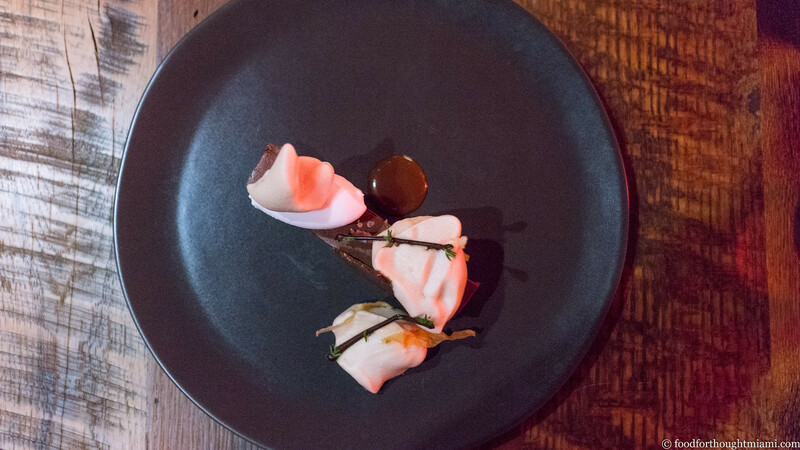 My favorite so far has been the brick of creamy, airy fudge (almost more of a cremeux) with Peruvian cacao, paired up with a parsnip mousse, coconut sorbet, a sweet reduction of J Wakefield Brewing porter (a Wynwood based brewery), and painstakingly assembled chocolate thyme sprigs. There's something about the coconut in particular that brings out the fruity, berry elements of the chocolate. The wine list at Alter is more of the "thoughtfully chosen" rather than "encyclopedic" variety, which makes perfect sense given the restaurant's size: about seventy bottles, at prices mostly around 2.5x retail. It would be nice to see more choices in a range closer in line with the dinner menu (for which appetizers top out at $15 and entrées at $30); there are about twenty bottles under $50, but the average price point is probably closer to $90. There's still plenty I'm happy to drink. And I've not even made a dent in their cocktail list yet. Service is another strong suit. 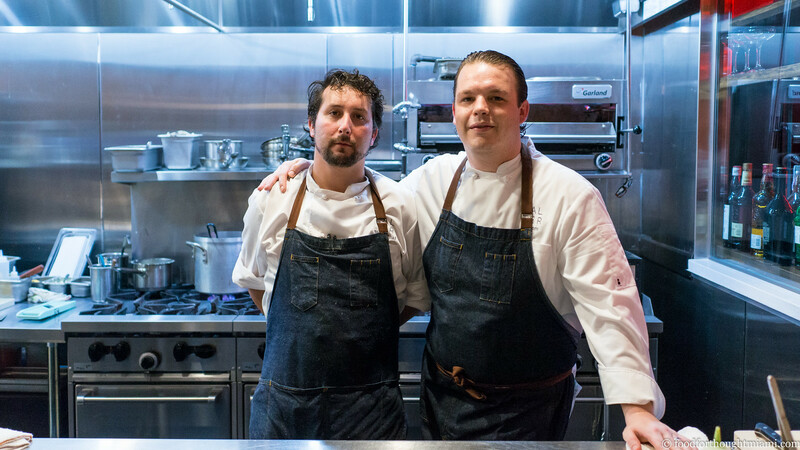 The Alter staff, led by Antoine Lecas (a veteran of the Fontainebleau, Juvia and Morimoto) don't have the polished suavity of a Michelin three star dining room, but they're consistently friendly, attentive, knowledgeable and genuine, again very much in tune with the surroundings. 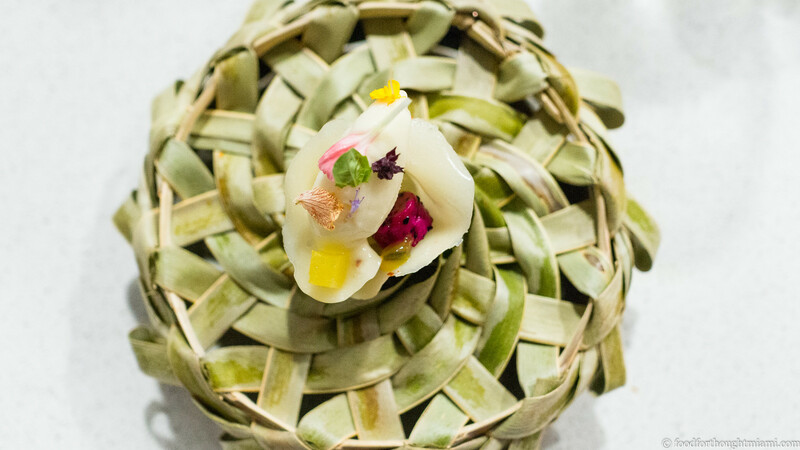 Miami has had a tremendous influx of new restaurants recently, but there are still only a handful of places that are truly ambitious. Alter is an ambitious place. It's not reflected in a million dollar build-out, or in thousand dollar place-settings; but it's reflected in the kitchen and on the plate, where I care about it most. And even more important: Alter not only strives; it achieves. I'm not remotely surprised by Brad's success. I'm only surprised it has come so fast. 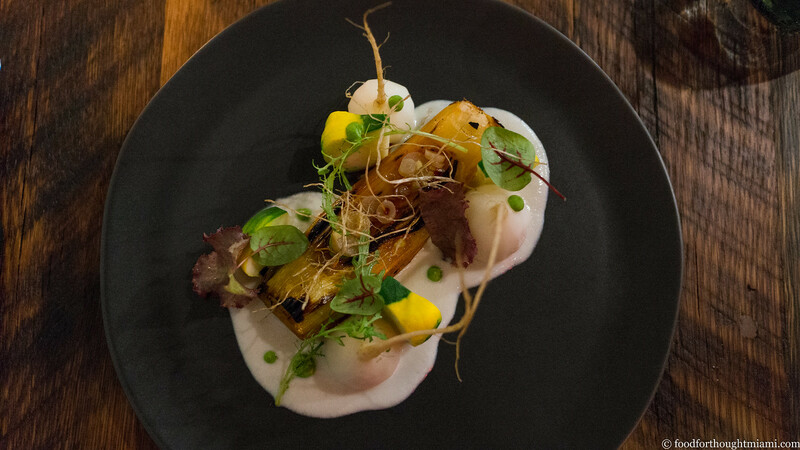 This is food that is as interesting and well-executed as any I've had in the past year. Zimmern even gave him a nickname – "Wall Street" – for his slicked-back Gordon Gekko hairstyle. The very sweet husband and wife team Jeremy and Paola Goldberg, who also ran the nice Coral Gables neighborhood spot Route 9, which they sold last year. Route 9 was probably more memorable for the controversy surrounding the New Times review of it than for its food. I would usually not write a full-fledged "review" of a place after only two months, even if the local papers of record seem to show no such hesitation lately. From my perspective, a lot of places are slow starters but sometimes find their way after several months. 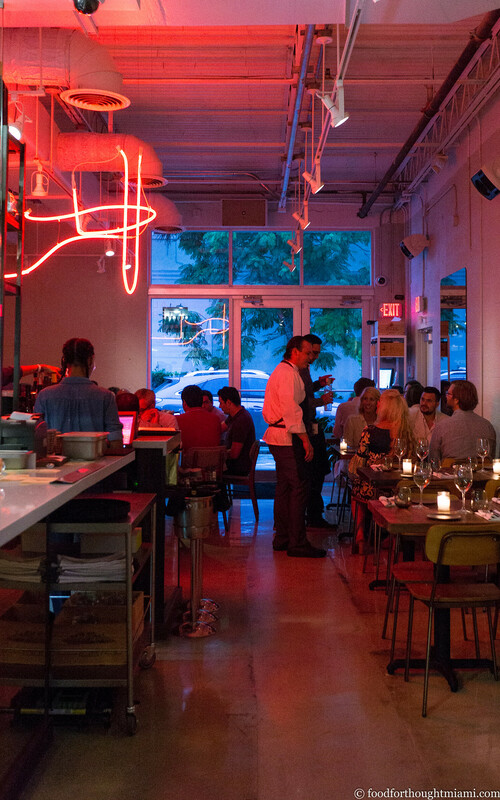 Just as many (and I'm looking mostly at you, out-of-town chefs who open Miami satellites) start out hot, only to fade fast as soon as the initial media crush recedes and the beefed up opening crew goes back home. I've made an exception here because Alter seemed to find its rhythm immediately, and my expectation is that it's only going to get better with time. I suppose I should also add here a disclaimer that I know Brad, that I have been "known to the house" all three times I've visited (it's a small place with an open kitchen and it's pretty much impossible to sneak in unnoticed), and that I've had a few extra dishes sent my way (which I always try to pay back with the tip anyway). 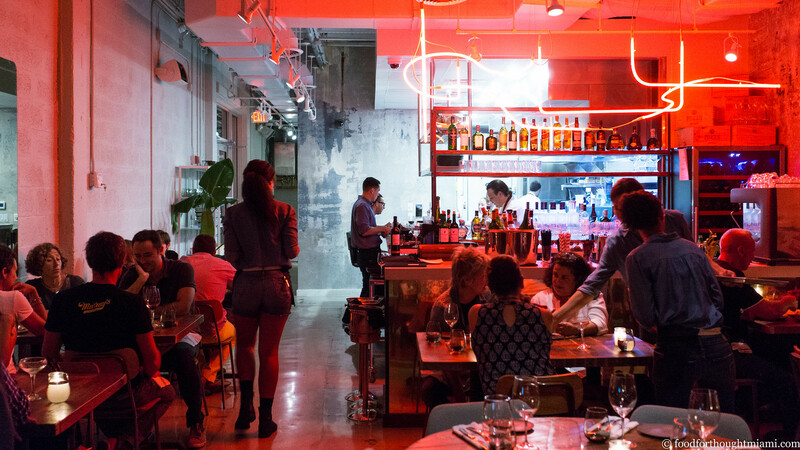 This formerly derelict warehouse district has become Miami's latest hot spot, primarily as a result of the vision and effort of the late Tony Goldman, who's been succeeded by his daughter Jessica Goldman Srebnick. Goldman did the same thing in New York's SoHo in the 1970's-80's, and then was one of the pioneers of South Beach in the 1990's. Goldman helped transform the Wynwood neighborhood over the past decade by making spaces available to art galleries, opening a restaurant to bring in visitors (Joey's, and then Wynwood Kitchen), and inviting street artists to blanket the walls of the warehouses with their work. Now, there's talk of hotels and condos, and tiny dilapidated houses are on the market for a million dollars because of redevelopment potential. Meanwhile, the art galleries seem to be trickling away as the rents go up. I suppose the cycle is inevitable. And if it affords an opportunity for places like Alter to succeed without having to kowtow to the South Beach tourist trade, that's a good thing. Celery leaf, with its fresh, vegetal snap, is to my mind a highly underrated ingredient. I've been following the evolution of this dish for about a year now. Brad served a precursor version of it at a birthday dinner I had at J&G last year. 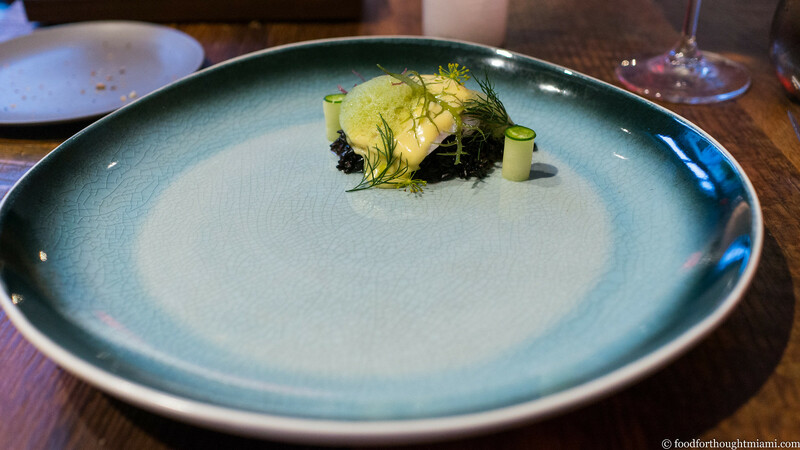 I then had another iteration late last year at a pop-up dinner he did while Alter was in build-out mode, which, given the kitchen limitations, was nowhere near as good as what he's serving now in the restaurant. 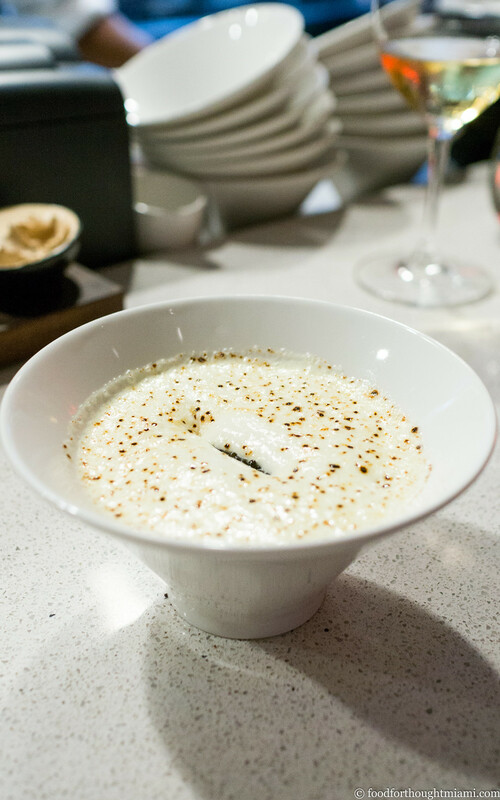 After our most recent visit, Mrs. F put this among her all-time favorite egg dishes: the egg with mushroom mousse and truffle at Madrid's Viridiana, and Robuchon's egg cocotte with mushroom cream and parsley. Again, the dessert technique showing up in a savory dish. I was looking back through old emails and found one that my chef friend Chad Galiano sent me after working the Azul dinner with Huff and Kilgore. He noted that Brad had been working on a strawberry gel sheet that went with one of the desserts, and how he was disappointed in the appearance because it came out cloudy. He kept trying and kept thinking about it until finally figuring out the component that was causing it to become cloudy, and was able to fix it for the batch that was served. Chad: "I gained a lot of respect for him because he just kept doing it until he got an acceptable result. He didn't settle for less." Hasn't changed. Though the sticky shell of the gyoza could still use some work. OK, not Saison, but, c'mon. Let me put it this way: as a South Florida native and champion of the local dining scene, I will confess that I may occasionally grade on a curve. Sometimes, there's "good, for Miami." Alter isn't "good, for Miami." It is, without qualification, one of the best restaurants I've been to all year.